You may remember, a few months ago, we shared a post about a client project we were working on for Summer 2017. It included some sketches of nuclear-inspired names for an ale brand. Here’s the finished result. 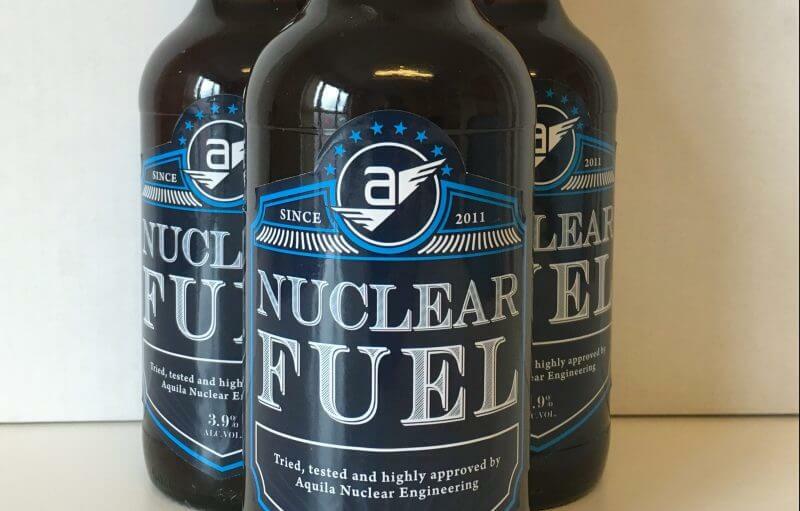 This is the ‘Nuclear Fuel’ ale brand that we’ve designed for our clients, Aquila Nuclear Engineering. We should point out very quickly that we’ve not relaunched ourselves as a micro-brewery, we’re still a design and digital studio! But we did speak to the lovely team at Bowman Ales. They are a local brewery who very kindly agreed to let us re-label their popular ale, Meon Valley Bitter. Coming up with the name and designing the brand for the label was the fun part. It looks incredibly smart and, if we ever did decide to go into brewing, we think this would look great on any supermarket shelf. Our designers have included all the information that appears on the original Meon Valley Bitter label. They’ve even added some suggested food pairings. The tricky and most time-intensive part was getting all 17 cases of ale (that’s 204 bottles) de-labelled. Did you see a question we posted on social media recently to find out what the best solution was to remove bottle labels? After a few experiments, it turns out that Sodium Bicarbonate is, by far, the winner. We’ve also learnt a lot more about the uses for Sodium Bicarbonate. This is something that Laura, the resident mum at The Glow Studio, already knows only too well. But it was news to the rest of us. Laura’s kitchen became the location for the the de-labelling process. As a result, at one point it looked like a scene from Breaking Bad. Barrels, buckets and basins full of sodium bicarbonate solutions all around the kitchen. You’re probably wondering what Aquila will be doing with all these bottles? Well, their lucky clients and employees will be receiving them as gifts over the summer. Do you think they’ll notice if a case goes missing? P.S. If anyone reading this is about to point out that we could have requested the bottles to be provided un-labelled – we know! Unfortunately, while Bowman Ales would have been happy to do this, our deadline just didn’t work with a new batch of the ale being produced.